Dana Altman was born June 16, 1958, in Crete, Nebraska. Altman played college basketball at Southeast Community College in Nebraska from 1976 to 1978, and then played basketball at Eastern New Mexico from 1978 to 1980. Altman graduated from Eastern New Mexico in 1980 with a bachelor’s degree in business. Altman began his coaching career at Western State in Colorado in 1980, where he served as assistant coach for the following two years. In 1982 Altman coached at his previous school, Southeast Community College. Altman then took the head coaching position at Moberly Community College in 1983, where in three years he accumulated a record of 94 wins and only 18 losses. In 1986 Kansas State University recruited Altman to become the assistant coach for the men’s basketball program. Altman worked at Kansas State for three years before becoming head coach at Marshall University, where he received the Southern Conference Coach of the Year in 1990. Altman then returned to K-State in 1990 as head coach. In his four years at Kansas State he brought the team from eight place in the Big Eight Conference in 1991 to an NCAA appearance in 1993, and was also named Big Eight Conference Coach of the Year that same year. In 1994 Altman became the fifteenth head coach at Creighton University. Altman coached at Creighton for 16 years, during that time making seven NCAA appearances and setting a 327-176 record. Altman was named Missouri Valley Conference Coach of the Year twice in 2001 and 2002. 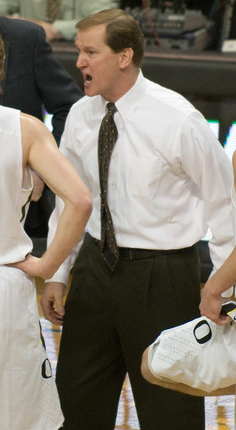 In 2010 Altman took on the head coaching position at Oregon University. In 22 seasons of coaching men’s basketball Altman has a record of 431 wins and 261 losses.